But you’re not sure if that makes you a writer. 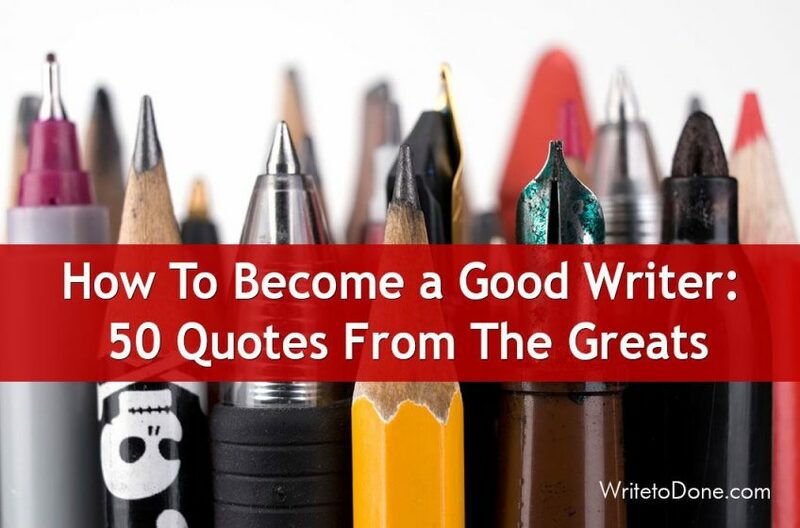 And you don’t just want to be any kind of writer; you want to become a good writer. It’s an exciting goal, but what’s the pathway? How to you get there? We’ve collected 50 inspiring quotes from writers for you. These writers share their experience of how to become a good writer. Some are wise, others are hilarious. Read them to be inspired, sustained and entertained on your journey as a writer. What’s the next step after reading these quotes? The next step is to open a page and start putting words on it. Whether you write great sentences or clumsy sentences, whether what you write makes sense or not… it doesn’t matter. First drafts are always clumsy and awkward. The only thing that matters is that you put words onto a page. Not some day in the future, but today! What are your favorite tips on writing? Tell us in the comments, and share this post if you liked it! Thanks for sharing this tip. Yes, of course, if you are a good writer, then these things are important to know. Al leer este correo, me doy cuenta que no estoy tan sola en este hermoso camino de la escritura, batallo igual que tantos otros en expresar bien mis ideas, ponerles sentimiento, identificar esos sentimientos, emociones y uf¡.Gracias por estar en su directorio.Sigo pendiente por recibir mas consejos que me son muy útiles. Gracias. Thanks for grouping such inspirational quotes for writers. Simply awesome and impressive. Hey Mary, Thank you for this awesome Quotes. 29. Y-e-a-h. Who wants to write what you know? You already know it. 36. That’s because you get so old while you are doing it. I’m sure I was a child when I started this book. Thanks for the entertaining thoughts. You write, and then you ask others to read. You comb through all that wonderful (and not-so-wonderful) feedback to find the closest thing there is to truth. You take that to heart – without blame or ego – and correct your course. That is no way to get creative. You cannot turn it on and off like a light switch. Sometimes the best things happen when your staring at a blank page and a half hour goes by and then you go, well writers write. So write. So you start writing a sentence and then another, and suddenly you realize that 45 minutes have passed and your hands have been flying all over the keyboard. I think this one is my favourite. My live has not been easy. Ever. Being raped, doing drugs, getting involved with prostitution, etc. has taught me to use writing as an escape. Now I use writing to earn money. Thanks Mary for compiling these powerful quotes. Although they are from fiction, and I just finished “The Paris Wife,” I’ll use them for all the non-fiction skills I teach my book coaching students and clients. Certainly for creative non-fiction. I’ll share these now on FB. A pleasure to join you! This fantastic set of quotes must be close to summing up the incredible adventure that is writing – setting out on a journey and ending up achieving what you dreamed of but not recognizing much at all of where you find yourself, surrounded by a crowd of new friends who couldn’t help but join you – that’s what makes it so hypnotic and addictive, wouldn’t you say? Thank you so much Mary, all of these quotes, every single one of them is truly inspiring! Great list! I love quotes and especially quotes on writing. #11 is my favorite in the list. For me, the best quote about writing, and life in general is Mary Sarton: “Now I become myself. It’s taken time, many years and places.” That resonates with me because I do my best work when I’m writing from my true self. And that’s why I shed my pseudonym. Thank you for the fifty short lessons and musings on the writing life, Mary! Yes, we write from life. And it’s solitary–but it’s also liberating–“creating”new worlds. These are wonderful, Mary. Since it’s always good to begin a blog post with a question or a quote, I’m always looking for inspirational quotes about writing. Thank you so much for taking the time to research and compile these. How inspiring…am dwelling on each of these and reaching for my notebook all the while…my daughter took it upon herself some weeks ago to send me quotes at regular intervals just to encourage and keep me inspired. I shall be sending her this link so that I can savour these one by one. “In your first draft, which you are essentially writing for yourself, let out any venom, frustration, and judgment you have about people you find to be selfish or ignorant. Don’t TRY to be kind, balanced, and understanding about them. Don’t reach too soon for your authentic compassion either. Because if you write as though you were already there, that compassion will only float uneasily on the surface, with those other feelings festering underneath, and your writing will be tense as you unconsciously try to mask them. “Don’t try to teach your reader anything yet. Notice that you are called to write a book about compassion because that is what God is trying to call forth and perfect in YOU. Once you are genuinely in touch with the source of compassion in yourself—which is the same source that all of your readers can access—only then can you lead them to that source, not preach to them about it. Most readers will catch the smell of preaching immediately and will feel “done to” even when your points are made in otherwise well-crafted, compelling stories.